For the longest time a faraway land pled for a pink Summer. The auspicious occasion brought on a false promise of hope and commitment. The foreign vision listed a huge asset as a byline for countries and wonders of the World. Be it Niagara Falls, cryptic road messages, colorful Graffiti and old bridge towns, the fortitude just needed five reasons to crisp the waves and smooth oceans. A Nomad falls in a different constituency. His life is a gold stroke. With private conversations and life of a spherical band, the perfect glide is an art. Going to Bali is a commitment. (Subtle reference to engagements aka Baat Pakki in Pakistan that are a vocal deal until the Nikkah; Bali over here refers to a ring that ponders on commitment.) It has ups and downs which releases yet picks up quickly. The point of location is a vivid indicator of immersion; to respect with a bit of love, honey and intention. A vegetable will still give life if you let it grow. The bass of a hold is hollow; yet fulfilling it is a necessity. The blow torch is a sparkle of life that can be planted out in clamors of sparkle and politesse. Getting in the shell is fast, coming out is a process. It’s built with bricks of determination and bronzed out destinations. “A book should not cost more than a pack of cigarettes” ~Mr. Allen Lane, founder of Penguin Books. A wise sycophant will portray themselves as weak. A liberated spirit will walk, run, cycle or even take a bus. They introduce an idea that develops and learns. Millions of people in developing countries have their sense of trust, instinct and belief. If you want to belong to a culture, taste their Onions. They will seclude you from any harm. Indulge with baked tomatoes and add meat and/or vegetable with salt according to taste. My sense of aroma would light up in the northern areas. They grasp a strong hold from behind. A sense of peace that only comes from Home. A six hour bed rest makes up for that. Wrong. A home is not just walls and a rooftop. It’s inside you. A nomad is power and curbs your own. Belonging is not my cup of tea. It’s coffee. Pakistan — Built in the 1940s, I’m from the third generation of hookahs, boiled eggs and cremated cigarettes butts. This form of socialization will get me to meet an Egyptian student, a Turkish navy officer, a Canadian drummer and my heritage of Jalandhar and Amritsar. From the province of Punjab that is famous for “chul” aka Party, Punjabi blood is raw and vivid. Loud, proud and the coleslaw crowd. Habit of listening is an art and I’m learning every day. Distinction is key yet average is also a number. Perfection is sweet yet overbearing. Molten with strong ‘juggad’, acceptance and tolerance is a protective gear. Follow the rule or follow the door; one must maintain flexibility and demand. Supply will be limited if it lacks give and take. An open mind is a virtue and wisdom is not a privilege. The hold of control must be let go to allow a trust fall. To be instigated, an idea is cult until broken into tiny shards of glass. Exploring and still learning, from mine to yours. I had been meaning to write for a while but you know, work, life, travels. So, when I first came to Karachi, I used to share a flat in Clifton with an old friend and her new friend. It was terribly complicated. I had five years more than the new girl but they had been living together for two years. So I was defensive to begin with in the first few months. They (these two) had lots of other friends that I didn’t know (I knew no one in Karachi other than cousins and family friends with whom, initially, I was reluctant to share my laissez faire sensibilities) and they all used to live in the same building or around; they used to congregate every evening, playing Pictionary and I used to sit in the corner, wondering when I would be fired from my law firm since my boss wasn’t looking too impressed in early few weeks. I was missing the pubs, smokingup or doing anything that was not so bloody kosher. I mean we were all in our early 20s and without parental control but here were these men and women, failing to procreate or do anything fun. They, the gang, as they liked to call themselves, were all imports from other parts of the country. All in Karachi to work for the MNCs and the other big set ups that made up the city. They had gone to big schools, had big ideas and all were on hunt to find the perfect mate to settle down. I used to dread coming home everyday to face their incredible drawing skills. They were very good people. I hope they remember me as fondly, as I remember them. But what struck me was that they would not engage with the city. They would order in from boat basin and hang inside and play. And I was going mad. So, in 2003, Karachi had the air of being very safe. No one I knew had been car jacked or robbed. The last murders of people I knew had taken place in 1986. I had just financed a KIA Pride. I was my own boss from 6 pm to 8 am and hence, to avoid coming home to the happening bonhomie, I started taking sneakers to work and would change into tracks and drive from work to Zamzama park, which was referred to as the General’s park . It was not as constructed and had an air of risk around it. I was harassed countless times . That didn’t bother me much. I am much tougher than I look. Occasionally, to alter the routine, I also went to Nisar Shaheed Park in Phase IV. That hasn’t changed much. It was not covered with stones and was smoother. I used to bump into my uncle a lot and we d talk about Musharaf, legal profession, pharma industry, Nihari. But soon the brisk walks or trots in these parks lost their charm. So, to make it more fun, I started going to sea view; I would park the car at one end (close to the Village restaurant) and run from one end to some distance along the beach. It was breathtaking. There were the camels, the popcorn walas, the early daters (it used to be still evening by Karachi standards, even past 7 30 pm and we are speaking of late autumn months) and I felt utterly free and safe and no one would give me a second look. I became friends with a flower kid. He’ d give me a rose every day. One day, I got up early and went for a run around 6 AM. It was an utterly different scene that early, no cars, no camels, no kids. A police van was doing the rounds. It was the van and me. So I braced myself and did what I had to do. And got out of the car and started running. And very soon I saw that the van was trailing me slowly. I was on the beach but I could see that it was following me. It was one of the eerie pre dawn hours when, the KMC garbage pickers had not come out. There was nothing I could have done at the time. It was just me, and the sea that could have provided some protection. My car was parked on one end. I could not turn around because this Police van was with me through out. I can’t remember if McDonald was around at the time. I can still remember the horror of what I felt at those moments. I was trying to remember all the past crime reports that I had come across that week. I could not remember anything but knew there had been incidents. I wasn’t afraid of attack so much as I was afraid of being taken away for questioning. I didn’t have any identification and had told no one that I was out there. I was not carrying my phone and my parents with all their military connections were in Morocco. That was it. I was about to become a statistic; I am sure I was convinced of it at that time. I know kept running. But then, I remember, the van stopped and one police guy came out. He started hollering. And it was clear he was shouting at me. So I stopped turned and walked to him. He was your generic Karachi Police Cop. Moustache, paunch, red eyes. He asked me what I was doing there at this time? Asked to see my ID (I had none). Then he stared at me long and hard. I heard snickers from the van, (there was one more in the front and maybe one in the back). Then the police man started on the idiocy of people in Karachi. He spoke at length on how people like me were asking to be raped and killed and create all sorts of trouble for him and his brothers. He asked me if a fisher man had decided to attack me what could have I done (it was not appropriate to tell him then that the only threat, I faced was from him). Anyway, it went on and on and he asked me what I did. I told him I was a lawyer. He said he had a kid in A levels and that was it. That’s the end. He walked me back to the car and asked to see the car papers (and I had none of those either-I kept them in the office for some moronic reason). He gave me another lecture and went. Soon afterwards, I discovered some mischief makers in my fraternity and that was the last time I got up before 6 AM. I no longer know where the two roommates are and how life has panned out for them. And for the life of me, I can not remember a single name from the other members of the gang. Readers club a welcome sign! The Readers Club is a voluntary, informal organization committed to the promotion of reading culture in Karachi. The Readers Club meets every Friday from 6.00 PM to 7.30 PM at the Shah Jehan Auditorium in the SMF Center. Please click here for more details on how to contact us. The Readers Club has been meeting since January 2001. The Readers Club does not meet on gazetted holidays and in the month of Ramadan. We try to keep things as informal and open as possible. You do not need to confirm in advance. There is no fee or requirement of any other sort to attend. We are a book club of sorts, but our format is a little unorthodox. While most of the Readers Club consists of voracious readers, we realize that it is unfair to expect them to read the same book in preparation for a meeting every week. Instead we adopt a different approach. The format of the meetings is quite simple. The facilitator speaks first and presents the book followed by a general discussion among the attendees. The format of the presentation varies with the speaker. Although the discussion is moderated, it gets pretty lively. Everyone is free to express their opinions, and we welcome them. Attendees are free to participate in the discussion or only listen if they wish. We like to encourage people to present books. After all, the Readers Club is a cooperative effort. If you would ever like to present a book, please do let us know. Please do not ask us to include/exclude any books/topics. We do not endorse nor censor any ideas/topics/books. Facilitators are free to choose the books they want to present. If you would like a book/topic to be discussed, we would like you to present a book yourself. We are proud of the fact that we try to provide an equal opportunity to everyone to express their views. When I woke up a couple of days ago, there was a certain air about Karachi. I couldn’t put my finger on it, but Karachi was smiling–and she wouldn’t tell why. In the time that followed, the mornings would be draped with a thin layer of fog, the evenings would be shrouded in chill. Karachi was smiling, because winter was here. Though we don’t get the snow most northern regions get, winters in Karachi has a life of its own. The weather isn’t that cold, but its cold enough that we still enjoy our ice creams, walks in the evening, and eating outdoors. Nobody asks for the AC remote, or reaches for the fan switch, save but a few hardened individuals who still love their fans and ACs even as the mercury drops. We are entertained by the ever cheesy Bonanza ads for sweaters on TV, and bonfires at the beach take special precedence in our weekend plans. There is nothing like an experience of friends gathered around the bonfire, each in their own refuge of thoughts, watching the fire flicker away–and sometimes, hardly a word is spoken between. Winters in Karachi also brings with it many unwanted guests. Dryness on our skin increases in some as we reach for the chapsticks even more so. The dew in the morning permeates over our cars quickly becoming the bane of our drivers/cleaners. There is increasing susceptibility to flu and other diseases. But cons aside, winter in Karachi has its special place. People still flock to the ocean, amid high winds and even higher gatherings. We admire ourselves in our brightly colored sweaters, pointing and laughing at scooter drivers wearing funny hats, and nuzzle within our own blankets as we ever so desperately try to break its embrace in the morning–and fail miserably. There was a time in the 1930-1960 era of this city when there were no transport issues. The city had a central artery road or the now M.A Jinnah road called Drig road at that time. 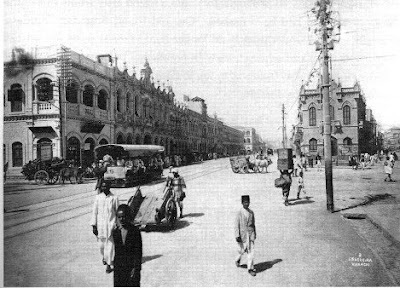 On this road used to ply the trams of Karachi, ensuring that the populace had easy access to the city center from different localities close to the tram line. Then came the mo dern era of this city and with the explosion of immigrants and the local populace the trams soon became a hurdle rather than a convenience. So the city administration opted for first public transport in the form of a circular railway and then later on when things really mushroomed private transport and the now existent transport minibus mafia took over. A recent example of the dubious nature of these mini bus cartels was when they allegedly indulged in the burning of 3-4 CDGK CNG buses and bus stops were attacked as well. Today has brought great news though as The ECNC has finally decided to revive the Karachi circular railway at the cost of Rs 128.5 billion. Although this is easier said then done but at least the first step or the planning stage has been initiated to provide cost effective transport for this cities residents. Any megalopolis the size of Karachi would have a huge subway system or at least a LFT over head rail system, we must provide for such facilities if we are to see Karachi go to the next stage. Although the last few decades have brought neglect to this city and its infrastructure, work has been done on it in the recent years under CDGK and the results are before us all. I personally would love to use a service like the circular railway rather than drive my car at snails pace to get to the downtown area everyday where it takes about 50 mins to cross a distance of 7-8 kms. You’ve GOT to check these out! 🙂 Enjoy, and see you at the gig! The joint action committee and civil society have organized a protest rally at the press club on Thursday 6th Aug at 4pm, to support the victims in the gojra incident. Demonstrations of this nature have been taking place all over the country to protest the atrocity against the christian community of gojra. Where 9 people died due to mob violence in anti christian riots. Please be aware that the Sipah Sahaba Pakistan has issued threats against people protesting this incident and supporting Christians, therefore we have no knowledge of the security conditions at this protest. Yayyy, the prediction says Karachi will have a thunderstorm this weekend! Yippeee. Coke Studio Season 2- Yay or Nay? Coke Studio is all over the place – advertisements, billboards, exclusive airing time on different channels, ring tones, the radio, you name it – its there. Season 2 was much anticipated, and so far two episodes are out – the first titled Individuality, and the second titled Harmony. Coke Studio has been creating some fabulous work – Season Two has been dealing with more contemporary artists, and a full fledged house band, accompanied by different guest artists to contribute their special feel to different tracks. Some of my favourite tracks so far this season have been Aik Alif and Khamaj is episode one, and Aaj Latha Neeyo , Daastan – e – Ishq, and Janey do in episode 2. Episode 3 should air this sunday, ie the 12th, at 7 pm. The cool thing about this season is that it ends on 14th August, ie, Independence day. On the plus side, the work being done, though heavy on the sufi side, is being done with songs that are popular, contemporary, and well loved, thus bringing an automatic appreciation in most cases for the mystic feel. The show has faced some serious criticism this time round for two reasons – the first being that the music from these contemporary artists doesnt live up to the hype created by their being included in this years line up. I personally feel the original version of Paimona Bitte is much better – im not a fan of the Coke Studio version, to say the least. The mixes aren’t as amazing as last year. Secondly the lack of a live audience has attracted many hisses and boo’s, but as I was given to understand earlier, having a live audience causes major recording issues, such as the murmers of voices, cellphone calls, doors opening and closing, etc. However, all in all, for a follow up season, Coke Studio’s not doing badly at all – they’re making music history loud and proud, and will probably go down, even if as a show steeped in branding, as one that helped enrich contemporary music with the sounds of folk lore and a tinge of spiritualism. Going to the beach on Sunday, we saw these signs up and I needed to get a picture – At firs we only saw- Go America Go, almost like a cheer! But then, we saw the rest and said…what the hell?? What is the deal with all these protests?